The above collection of quotes from actual women veterans who had experienced homelessness after military service is quite moving. You can see the whole album on Facebook, here. If you’re new to this topic you might be surprised it’s even an issue. Especially if you’re paying attention to the numbers produced annually by the U.S. Department of Housing and Urban Development (“HUD”), you might be very surprised to learn that with a population of approximately two (2) million women veterans across the U.S. that fewer than 5K are homeless. Well, the reason why that figure is so extraordinarily “off” goes to methodology of how “the count” is actually obtained. 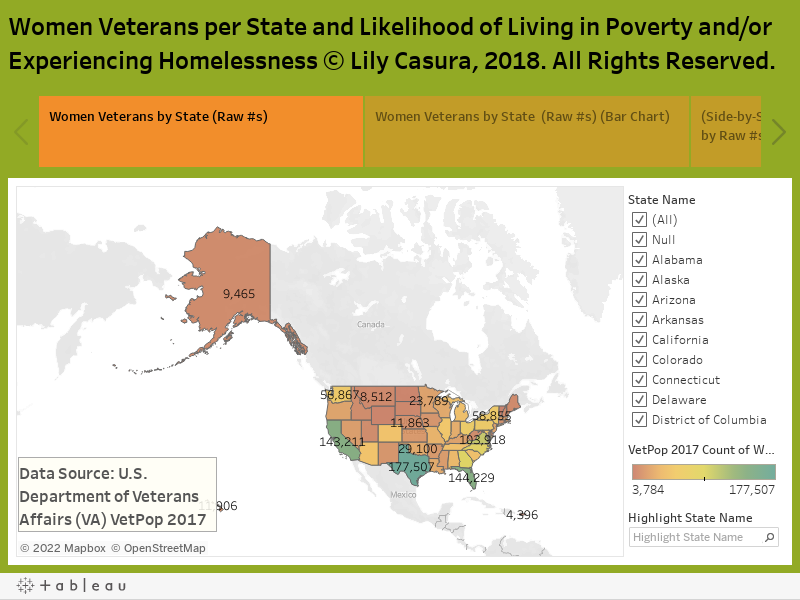 A few years ago, once I started doing Institutional Review Board (“IRB”)-approved research into women veterans and homelessness, I was able to find in the U.S. Department of Veterans Affairs (“VA”)’s own research a much more likely-to-be-accurate way to estimate how many women veterans are homeless at any given time in America. And then, armed with those new numbers, I started to map it. I even went one better than VA, which uses a strict 10 percent poverty estimate for their computations, and started changing the estimate to the state’s own estimate of poverty, recomputing the numbers and then creating new maps. You can see the results of that effort here and here. I hope it helps. I do notice VA now references their own estimates these days, which I hope the above work helped them reconnect with. They make way more sense than the very lowball estimate, based on a methodology (and a definition) that don’t fit women veterans as they experience housing instability today. Editor’s note: You can see the fully interactive data visualization thumbnailed above, here. If you’re a woman who served in the U.S. military during any era, please take a few minutes and complete a short, Institutional Review Board (IRB)-approved survey about housing issues after military service. Thank you!